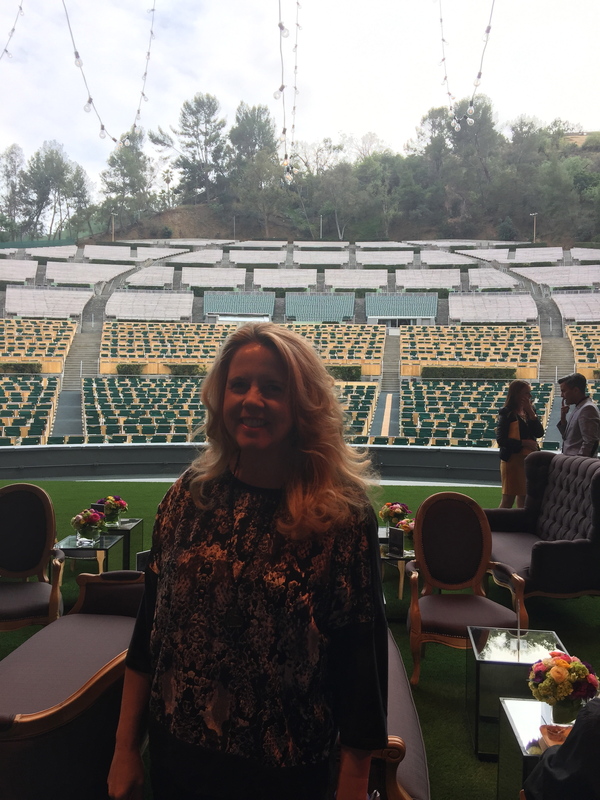 Walking onto the stage of the Hollywood Bowl and looking out to the box seats all the way up to the $1 seats is a “pinch me” moment. I was invited by the wonderful LA Phil and Patina Group P.R. team to experience a multitude of dining options served at the historic Hollywood Bowl. 1. Organic and Vegan Cuisine. 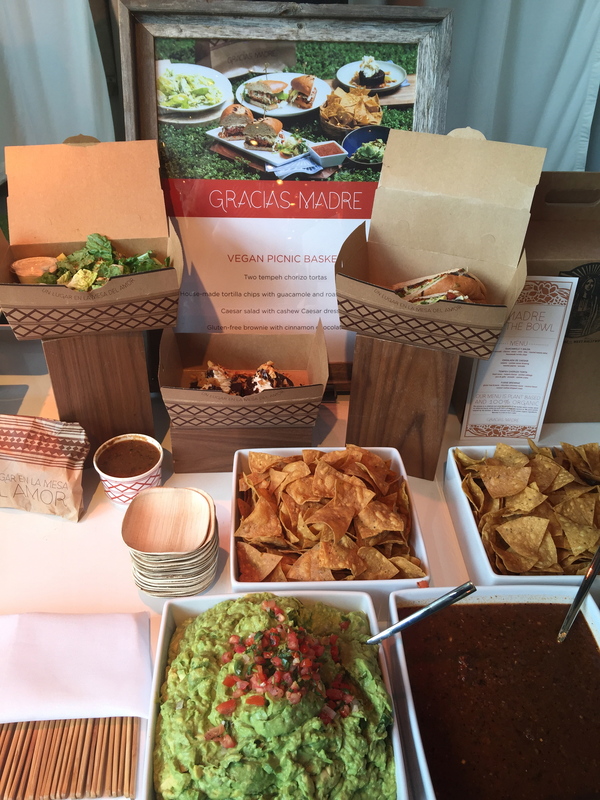 This year Patina Restaurant Group has partnered with Café Gratitude and sister restaurant Gracias Madre to provide all-organic menus at Market Cafés, Rooftop Grill, The Wine Bar, and Staccato. The new plant-based dishes include raw pesto kelp noodles, raw tiramisu, and a coconut bacon sandwich. The vegan BLT is made with coconut bacon, tomato, lettuce, onion, chipotle cashew aioli, whole wheat tortilla, side mixed green salad, and a goji-chipotle dressing. They also offer a Raw Pesto Kelp Noodles, basil hempseed pesto, cashew ricotta, heirloom cherry tomatoes, green and Kalamata olives, arugula, Brazil nut parmesan and chopped basil. There is a Macrobiotic Bowl offers sea palm, shredded kale, sprouted probiotic rice, kimchi, shredded carrots, shredded beets, teriyaki almonds and garlic tahini dressing. A vegan dessert is a Tiramisu cake made with date paste, coconut oil, Himalayan salt, vanilla, almond flour, almond milk, espresso and coconut oil. The filling is Irish moss, almond milk, date paste, cacao powder, vanilla, salt, lecithin, coconut oil and agave. The whipped cream is made of cashews, coconut milk, agave, Himalayan salt and coconut oil. There is also a selection of Cold-Pressed Juice by Café Gratitude with a Complete kale, cucumber, apple, celery, lemon, ginger. There is a Divine juice with apple, beet, lemon and ginger and Passionate with orange, ginger and carrot. 2. Ray’s & Stark Bar’s is offering their popular bottled water program featuring eight carefully curated domestic and international varietals personally selected by the company’s, and America’s only, certified water sommelier Martin Riese. These waters offer higher TDS (Total Dissolved Solid), with more minerals and health benefits than many bottled waters. 3. The Boxes have been renovated with yellow Alaskan cedar wood on the walls and floor. There are two types of new seats in the box area. 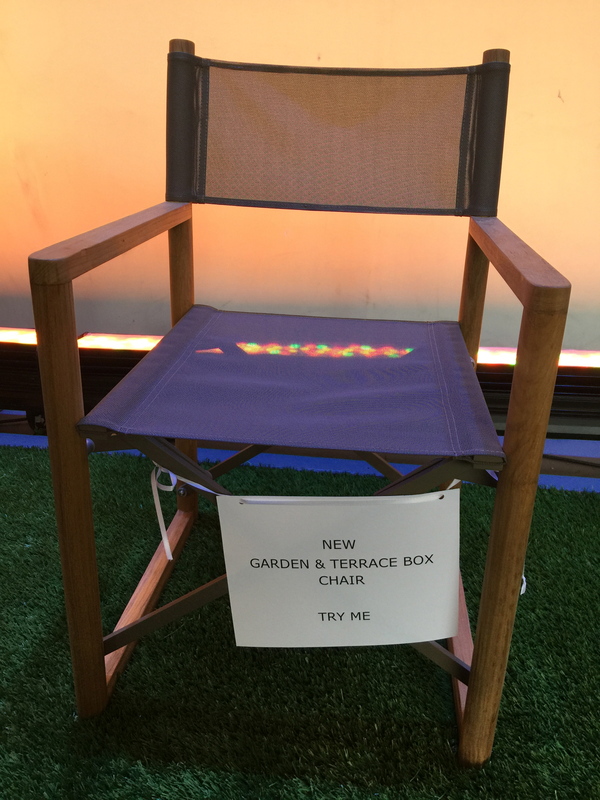 There are the stylish Garden and Terrace Box chair and a very comfortable padded Pool Circle chair. 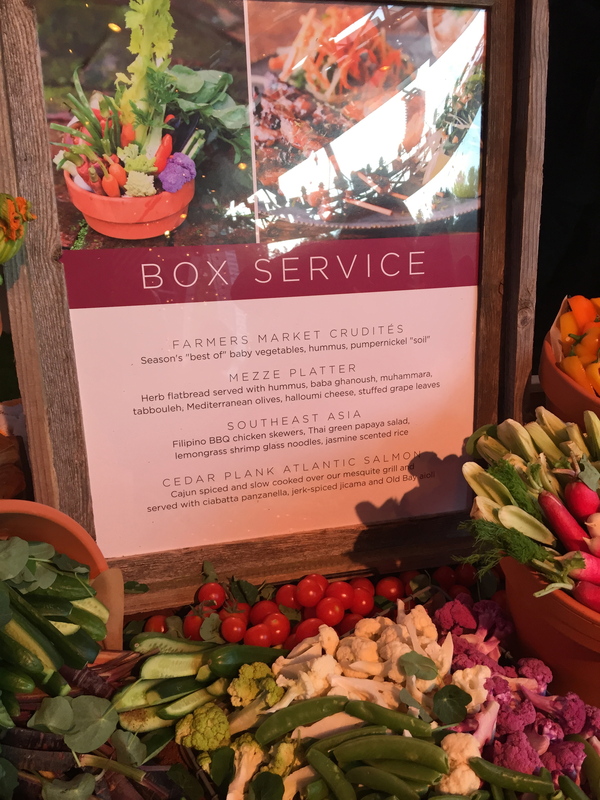 Box Seat Ticket Holders are tended to by a dedicated wait staff, trained in the Patina Restaurant Group standard of attentive and personalized service, a wide selection of 3-course chef menus and a la carte offerings. There is a Spa Menu with Rainbow cauliflower “couscous”, Scarborough Farm teenie greens, Green Goddess emulsion and Adam’s Ranch unfiltered olive oil. Also, grilled Atlantic salmon with Brentwood Farm sweet corn, roasted French breakfast radish, lacinato kale and salsa verde. Box Seat ticket holder can order edible centerpieces that includes Harry’s Berries—2 lbs. of locally grown strawberries served with raw dipping sugar; Farmers Market Crudités from local Farmers markets served with hummus and pumpernickel; Caprese with fresh bocconcini mozzarella and toy box tomatoes. Dining for Two in the box offers an indulgent roasted Rib-Eye- 18 oz steak grilled over mesquite and served with sliced heirloom tomatoes, summer green beans and herb chimichurri. Also a whole rotisserie chicken- 3 lbs free range chicken served with wild arugula, grilled asparagus, roasted potatoes and garlic aioli. 4. “Neighborhood Take-Out”- designed to honor the unique neighborhoods flavors of Los Angeles.Enjoy South East Asia with Filipino BBQ chicken skewers, Thai green papaya salad, lemongrass shrimp glass noodles and Jasmine scented rice. The Mediterranean Kabobs are herb marinated beef kabobs, sumac grilled vegetables, tabbouleh, pickled turnip salad, pita and garlic butter. Craving Chinatown cuisine with Char siu roast pork, garlic noodles and dim sum dumplings or Chinese chicken salad with wok’ed vegetables. How about Southern Comfort—honey stung fried chicken (6 pcs), creamy coleslaw or Smokey Jo’s baby back ribs, mac & cheese and warm glazed cinnamon rolls. 5. 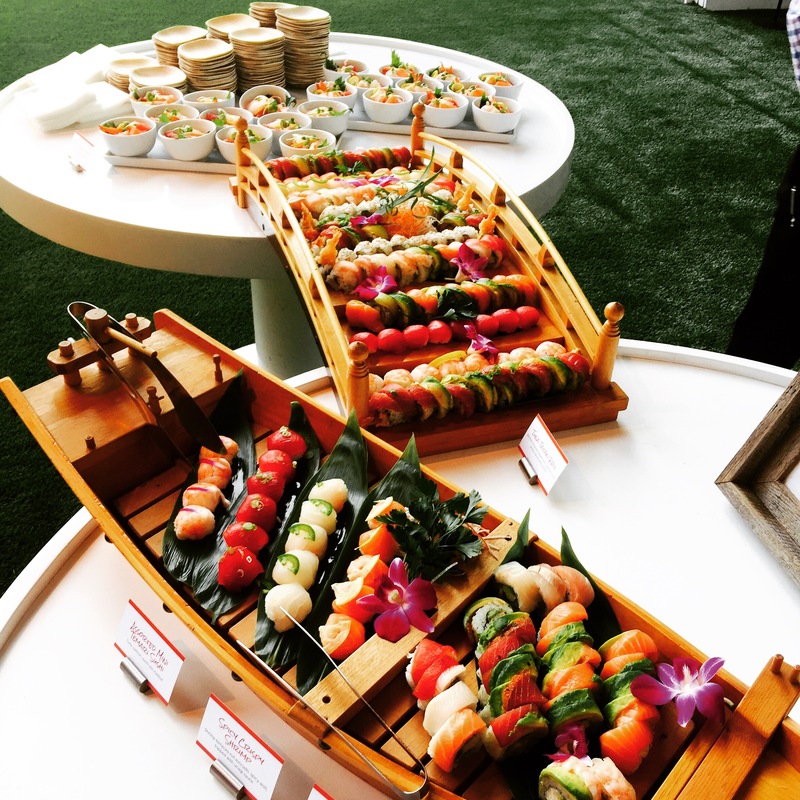 The Nishi Sushi Bar at Market Café West has an onsite sushi bar prepared byChef Travis Kamiyama prepares fresh sushi and Japanese delicacies daily. Order the Kamiyama Premier Platter with Rainbow roll (8 pcs), salmon lovers roll (8 pcs), dragon roll (8 pcs), spicy tuna roll (8 pcs), California roll (8 pcs), spicy crispy shrimp (8 pcs), tuna tataki (8 pcs), veggie roll (8 pcs). The SAN Jyubako Box serves one person with a Seaweed salad and assortment of Japanese side dishes Spicy tuna roll with wasabi and gary; 5 pcs assorted sashimi with tsuma and shiso leaf; Albacore tataki salad with yuzu wasabi dressing; Teriyaki hanger steak with Japanese rice and sesame seeds. Finish with Summer strawberries and lychee. 6. Full service Steakhouse at Rooftop Grill, inspired by PRG’s acclaimed Nick + Stef’s Steakhouse. The Rooftop Grill provides the best cuts of meats in an al fresco setting overlooking the landmark music venue. Dishes include Crab Louis salad; Ahi tuna tower; Rib-Eye, Filet Mignon and Flat Iron Steak with add-on selections include “Oscar style” and foie gras butter. They also prepare a Citrus marinated half-chicken, yuzu pico de gallo; San Luis chicken sausage and a gooey cast iron chocolate chunk cookie, caramel with campfire marshmallow. 7. Staccato is the to-go spot for gourmet international street food before ticket holders head to their seats. There is a “Pool” Burger- 1 lbs. angus burger stuffed with foie gras, candied bacon, gruyére cheese, baby arugula, black truffle aioli. The Thai chicken sausage is served with pickled green papaya, jalapeno, cilantro and garlic aioli. Korean short rib Hollywood “Bowl” with jasmine rice, scallions, grilled shishito peppers and a chocolate “Moon Pie” with caramel dipping sauce. 8. The Wine Bar is an al fresco wine bar and lounge offers a relaxed atmosphere with variety of craft beer, curated wine, soju cocktails, and unique small bites and large plates. Plates include Wasabi tempura fried squid, Sriracha sabayon; Charred octopus, heirloom rice, and salsa verde; Duck foie gras terrine, crème fraîche, salted dulce de leche, baguette; Steamed fresh mussels and clams, fennel, romesco; Crispy pork belly sliders, Hawaiian bread and jalapeño compote; Wine Bar grilled cheese, fig jam, fromage d’Affinois, fried sage; Duck confit tortellini, fresh peas, fine herbs and Lamb “shawarma”, pita chips, hummus and goat cheese. 9. 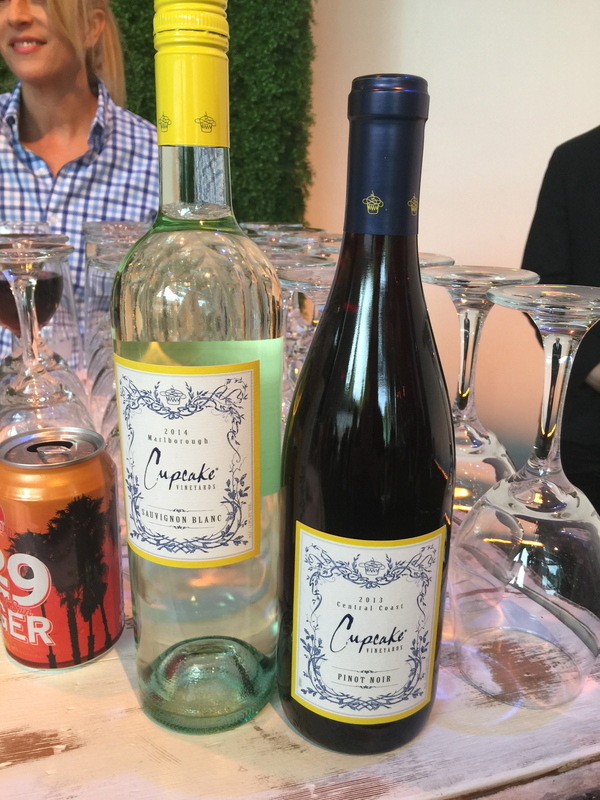 For more casual fare, Market Café East and West is an ideal place to pick up last-minute food items prior to each performance with a selection of salads, wraps, cheese, wine, and assorted sweet treats. Dandelion (serves two) with Honey stung golden fried chicken (8) with warm glazed cinnamon rolls (2) Country style potato salad, Organic baby mixed greens with balsamic vinaigrette and Summer strawberries with vanilla cream. Gracias Madre Vegan Picnic Basket (serves two) Tempeh “chorizo” torta (2) with black beans, avocado, pico de gallo, pickled cabbage, cashew creme. House made tortilla chips with Guacamole and Roasted tomato salsa. Pumpkin seed Caesar salad with cashew Caesar dressing. Finish with a gluten-free fudge brownie with cinnamon chocolate sauce. Patina Restaurant Group provides an online ordering site to simplify the process. Guests can order at http://www.patinagroup.com/bowl.